Appetizer. Bacon-wrapped dates. 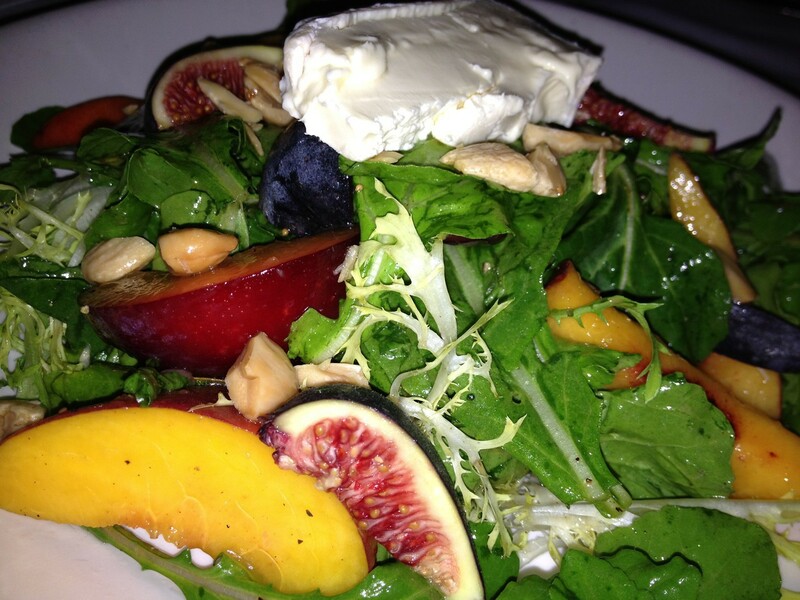 Arugula salad with figs, peaches, ricotta? and marcona almonds. Feast. 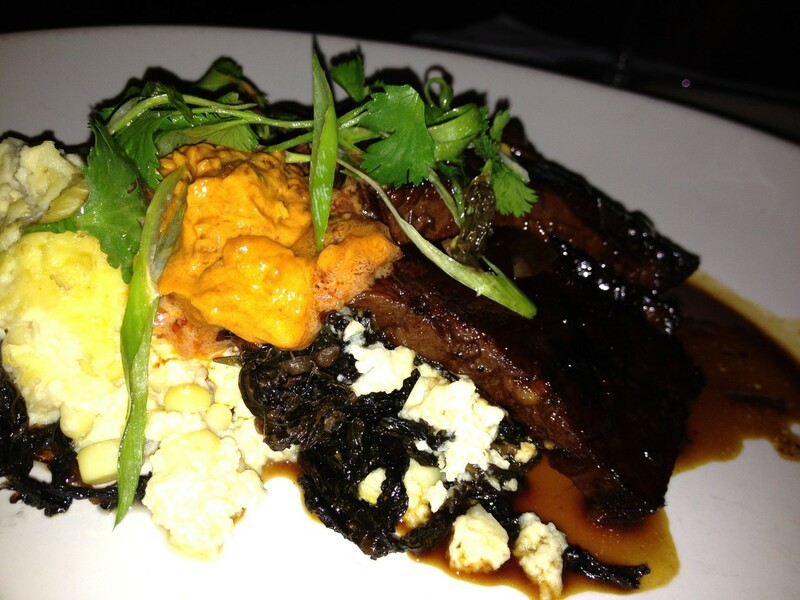 Braised beef brisket with black kale, corn puree, and chipotle? crème fraîche. Beef brisket with chipotle creme fraiche. 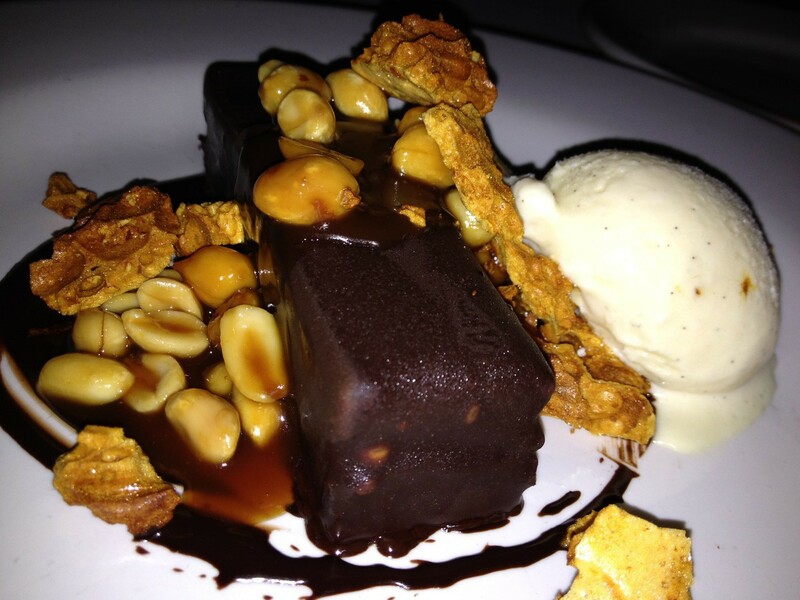 I wasn’t overly impressed with dinner; it was a solid meal from Suzanne Goin. I did enjoy the application of the chipotle crème fraîche as a sauce, rather than the standard demi-glace, or some other sort of reduction. The crème fraîche was a rather reminiscent experience that reminded me of Austrian beef with horseradish sour cream and chives. The chipotle though, worked cohesively. Creamy with meaty. Crème fraîche sounds like a fancy word, but it’s really no different from yogurt. Crème fraîche is basically thickened cream by way of fermentation. It’s rather low in protein (small amounts of casein) as it’s basically fermented supermarket heavy cream, started from a dash of cultured sour cream (or yogurt). Given its low protein qualities, it’s actually a nice way to thicken a sauce and add a bit of tart, without the risk of curdling (clumpy bits of denatured protein in your sauce). Analogous to yogurt making, it’s fairly easy to do at home. All that is required is a base (heavy cream + a bit of sour cream, or milk, in the case of yogurt), a starter (cultured sour-cream, or a scoop of yogurt, respectively), and some time.